This last post about William Dawson covers the final year of his life and draws some conclusions about his family, his death, and his place in this Dawson lineage. I have spent a lot of research time on William after learning about him a few years ago, and I feel fortunate that he left a significant paper trail to follow. His tavern license was renewed again in February 1761, but when the Cumberland County Court assembled again in May he was not present and was only listed as having “an account due”. It would appear that he was either ill or perhaps out of the area. In either case he never returned to his duties as a Justice. Only his widow, Frances Dawson, returned to the court to present William’s estate inventory during its August session. There is a will for William Dawson mentioned in a 1770 deed but the actual document does not appear to have survived. However, in this deed dated 17 May 1770 his son, Joseph Dawson, sells 220 acres that he received from William’s “last will and testament”. This was half of the 440 acres that William purchased from Edward Connor in 1760 and which had apparently become his primary residence. The other 220 acres was left to Joseph’s brother, William Jr. What is interesting about this property is that it is divided equally between his two sons – Joseph and William – but no mention is made about his third known child, Jonathan. Jonathan was born around 1761 so it is possible that William died before making any provisions for him (1). In fact, Frances may very well have been pregnant with Jonathan at the time of William’s death. One thing I would like to note here is the odd similarity to the stories about Frances’ first husband, Jonathan Dawson “the mariner” (who is said to have died in about 1751) and her second husband, William Dawson (who died in 1761). According to family folklore (2) Frances was supposed to have been pregnant with her third child, Jonathan Jr., when her first husband, Jonathan, died at sea. Although the dates for this version of the story don’t match the records (3), it is extremely likely that Frances was indeed pregnant with her son Jonathan when her husband died, but that this should be property attributed to William Dawson’s death in 1761. This is further supported by a complete lack of evidence that Jonathan received any inherited property although this evidence does exist for both of his older brothers. If you add to this the record of William Dawson having “an account due” to the court, I think it is likely William was simply out of the area during its May session. Depending on where he was he may have actually been the one who was lost at sea or even in a boating accident along the Cape Fear itself. Given the age gaps between his known children (4) I think that William and Frances had other children that have been forgotten in the family folklore. I think that after Joseph there were perhaps two other children born in around 1752 and 1755. These were possibly a daughter and then a son named Jeffrey who died while still quite young. I want to make sure I emphasize that this is pure speculation on my part and no evidence exists for them. However, In addition to these other possible siblings I think it is even more likely that there had been an older sister of Joseph’s named Mary who later married William Llewellyn (5). You may notice that in this post I am attributing Joseph Dawson to being a son of William Dawson. As time goes on it has become harder for me to reconcile the existence of a first husband of Frances Rouse named Jonathan Dawson. I go back and forth on this frequently but there are no deeds or other records to support that Jonathan was ever married to Frances Rouse at all. Even in deeds Joseph refers to William Dawson as “my father” so these days I am inclined to think that the names Jonathan and William were simply confused in the family folklore. However, that being said, there is at least one deed where William Dawson refers to himself as the “eldest son” and “sole surviving heir” so he did have a brother. Perhaps in time this will turn out to be Jonathan Dawson. I will certainly keep an open mind about it. After William’s death his wife Frances did marry again and with her new husband, Captain Jefferson Williams, it was not long before the entire family left the Cape Fear region and headed for South Carolina. By the outbreak of the American Revolution they were all firmly established in South Carolina’s Back County near the OId-Ninety Six district. William Dawson may have died young but his family certainly thrived. His son’s Joseph, William and Jonathan all enlisted in the South Carolina Militia during the Revolution, served with distinction, and then went on to have large families of their own. Note (1): I have never found any deed that suggests Jonathan Dawson (born about 1761) received any inherited property from William at all. Note (2): the traditional account of Jonathan Dawson and Frances Rouse is that their son Joseph Dawson was born in 1745; William in 1748 and Jonathan in 1751 after his father had already died at sea in about 1750-51. I have been able to verify that the birthdates were all incorrect. If any of the children could have been born to Jonathan Dawson and Frances Rouse it would have been Joseph but that is unlikely. Note (3): Jonathan Dawson is supposed to have been born in 1750 according to family folklore but this date is about 10 years to late from what the records suggest. In addition to the evidence pointing to a 1761 birth date mentioned above are the records about his family and his service in the American Revolution. He was the last of the three bothers to enlist with his first mention in 1781 which would make him about 20 at the time. What’s more significant is that he didn’t start a family until after the war. If the 1761 date of birth accurate then his first child would have been born when he was 37 years old and the last when he was 53. Although it still seems a bit late by the standards of his day he would have been 48 when his first child was born for the 1750 birth date to be accurate. Note (4): Joseph Dawson was born about 1749 based on the dates of his earliest land transactions and his marriage to Elizabeth Gibson. The age of the next sibling, William Jr., is confirmed in two documents (both Revolutionary War pension applications) to have been in 1758. Note (5): There is a Mary Dawson of unknown parentage that marries a man named William Llewellyn in about 1760’s. This William Llewellyn may have been related to Jonathan Llewellyn, the long time friend of the Dawson family. In the last post I talked about William Dawson’s life prior to his marriage and family. In this part I want to describe some of the details related to his rise to prominence in Cumberland County. He married Frances Rouse (1) in the late 1740’s or early 1750’s, but they are definitely documented as being husband and wife by 1754 (2). During the early 1750’s William and Frances were busy running their tavern and ferry while starting a family. Their first son, Joseph, was born around 1750 (3). During this period William was establishing himself in his community as well. He had been appointed as a Justice of the Peace around 1754 (4) when Cumberland County was first formed out of Bladen. It is also on record that he became a Vestryman when St. David’s Parish was formed during that same year. By all accounts he was certainly doing well by 1755. At the age of 25 he owned close to 1000 acres (5), was married, had one known child, and had become appointed as both a Vestryman and Justice of the Peace. His role in the community was firmly established and his future must have looked bright indeed. In 1755 William was closely involved in the decision to determine the location for the newly formed Cumberland County’s first courthouse. Along with his long time friend and neighbor, Thomas Armstrong, (and another justice named Gilbert Clark) they decided to place the courthouse on property near the Cape Fear River in a location that was primarily accessible by the popular road called Green’s Path to the Pee Dee. Locating the courthouse along two major travel routes (Green’s Path and the Cape Fear River waterway) made a great deal of sense but it was also an excellent location for William’s business interests. Travelers along Green’s Path needed to use the Dawson’s Ferry to cross the Cape Fear so this location was certain to be a boon to him financially. The late 1750’s also marked several accomplishments for William. Documents from 1757 show him bearing the title of Esquire along with a record showing the renewal of his tavern license. Another document from this same year shows that he had managed to get the North Carolina General Assembly to write legislature for providing upkeep for his ferry business. The Governor seemed to agree with the petitioners and on the 28th of November Thomas Armstrong was struck from the Commission of the Peace and was also named by the North Carolina General Assembly as a “person of bad character.” In subsequent minutes of the Cumberland County Court of Common Pleas Thomas Armstrong was never listed among the Justices again. William Dawson seems to have escaped the scandal though as he remained a justice and was listed in the minutes regularly through 1761. William’s family life during this period was active as well. In January of 1757 Anthony Berry (the three year old mulatto son of a woman named Margaret Berry) was bound to William Dawson. Unfortunately, a year later Margaret Berry was again in the Cumberland County Court with another child that was to be bound out. While there she confessed that Anthony was born while she was still a servant and the child was apparently taken away from the Dawson household (although the record is a bit vague on this fact). What is known is that the two year old child she brought to the court this time, named John Berry, was bound to William Dawson 18 January 1758. Amid all of this Frances had become pregnant again and she gave birth to their second son, William Jr., later that same year on the 14th of November. This brings up an irregularity in the family that still puzzles me. The birth date of William Dawson Jr. as being 1758 is well documented (6) and Joseph Dawson was almost certainly born around 1749 but perhaps as late as 1754. In either case there is a substantial gap in the ages between these two children that has no explanation. My only guess is that other children had been born that did not survive into adulthood or that Frances and William had difficulty conceiving. The idea that at least one child had died young is supported by another odd absence. There is no evidence of a child named after his father, Geoffrey despite his having three sons. The year 1760 was an interesting one for William Dawson. In January he sold the remaining 308 acres he still held of his father’s original land grant to John Smith. I believe this is the same John Smith who was to rename the ferry “Smith’s Ferry” which can be seen marked on maps made of the Cape Fear River during the American Revolution. By selling the old Geoffrey Dawson property and home it looks like William had wanted to get out of the ferry business. He must have still enjoyed owning a tavern though because he was again given a license to run an ordinary at his home during this same year. This new home was probably located at a 440 acre parcel he bought in February 1760. This property was very close to the old Geoffrey Dawson land he had just sold but it was on the courthouse side of the Cape Fear and right next to the property of his associate William Robards. These 440 acres are also significant because William divided this property into two parcels and left them for his sons Joseph and William Jr.
By November of 1760 his friend and new neighbor, William Robards, had died. In the November Court William Dawson presented the Deeds of Gift from William Robards to the various members of his family and they demonstrated a great deal of warmth between William Robards and his family. However, I found this November court to be primarily interesting for another reason. The records of this court hold the first mention in Cumberland County of a man named Jefferson Williams. He was a witness for a deed involving William Robards Jr. and which was also witnessed by William’s long time associate, William Hodges (7). This places Jefferson Williams clearly in the social circle with the Dawson, Robards and Hodges families – all of which is very intriguing as Jefferson Williams married William Dawson’s widow, Frances, after he death just one year later in 1761. Note (1): Frances Rouse may or may not have been married to Jonathan Dawson prior to her marriage to William Dawson. Note (2): A deed record for Cumberland County on 22 April 1754 lists “William Dawson and Frances his wife” selling property they co-owned with William and Patience Hodges to a man named Robert Williams of South Carolina. This is the earliest record of the marriage between William Dawson and Frances Rouse. Note (3): Joseph Dawson was probably born in 1749. This date is estimated from the record of him selling land he inherited from William Dawson, “my father” which suggests he was at least 21 in 1770. Note (4): William Dawson is recorded as an established justice – not newly appointed – in the North Carolina Assembly Minutes from 1755. Note (5): It looks like he William had about 1000 acres in 1755. It can be difficult to sort out all of the land transactions and I am sure there were some that didn’t survive but I feel fairly certain about this figure. Note (6): The birth date of William Dawson Jr. is recorded in his testimony for his Revolutionary War service pension. It is also corroborated in the pension application of Joseph Hodges who listed him among his relatives and also provided his birth date. Note (7): Based on the transcript of the pension application testimony given by William Hodges’ son, Joseph Hodges, it is likely that William Dawson and William Hodges were related by either blood or marriage. Finding William Dawson of Cumberland was one of the greatest successes I have experienced while doing family history research. It started with William Dawson Jr., who in his pension application for service during the American Revolution mentioned that in early 1779 he returned to his “native place” of Cumberland County. I knew the Dawson family was from North Carolina but that one phrase made me think that Cumberland County may have been his place of birth. That turned out to be the case and it led me to discover an ancestor who had been forgotten in the family traditions. This was the existence of William Dawson Sr., tavern keeper, vestryman, and Justice of the Peace. As I mentioned in my post about Geoffrey Dawson, the origin of the Dawson family prior to their arrival in Cumberland County is unknown. I estimate that Geoffrey’s oldest son (1), William Dawson, was about 8 years old when the family arrived on the Cape Fear in 1737. The name of his younger brother is never specified but I will explain later that I believe he was the Jonathan Dawson who married Frances Rouse and was later lost at sea. Not much is known about William’s childhood but it is likely he worked on the family farm and in the tavern after it was established. As there is no mention of further siblings other than William and his brother I suspect that his mother may have had died early. Perhaps it was even prior to the family settling in Bladen County. At some point William did receive some degree of education and was certainly literate as an adult (see the earlier post about his books). The late 1730’s was also the time when Jonathan Llewellyn started to become associated with the family and he eventually settled on property adjacent to the Dawson land. This close family friend would soon play a major part in William’s life. In 1740, when William was 11, neighbors settled on the parcel of property along the southern boundary of the land owned by the Dawson family. This was a Highlander named Thomas Armstrong, his wife Margaret and several children (2). They are on record as part of the group of “Argyll Colonists” who arrived in 1739 aboard the Thistle (3). Thomas Armstrong appears to have been a man of some distinction and he rose to prominence in Bladen County quite quickly. He became a Justice of the Peace for Bladen sometime in the 1740’s and was appointed Coroner for Cumberland County in 1755. It is just my opinion but I think William might have been apprenticed to Thomas Armstrong as perhaps a clerk and that may have been where he received his education. As I mentioned earlier, I think that William’s younger, unnamed sibling was the Jonathan Dawson who is mentioned as the earliest Dawson ancestor in those family histories originating on the Cape Fear. I think that with William poised to inherit their father’s estate his younger sibling Jonathan joined the Royal Navy as a midshipman. Typically this would have been between the ages of 12 and 14 so this would mean he would have left the Cape Fear around 1743. Meanwhile William would have remained in Cumberland and learn how to manage the small estate that he would one day inherit. However, in 1745, tragedy struck when Geoffrey Dawson died and William and Jonathan were left as orphans. It is in this year that Jonathan Llewellyn is entered into a bond to oversee the Dawson estate until William Dawson came of age (4). There is an odd land transaction that seems to support this where 100 acres of the Geoffrey Dawson estate is given to Jonathan Llewellyn who then gives it to William Dawson. It is then returned to Jonathan Llewellyn in 1750 when William turns 21. Regarding William there isn’t much about him between 1745 and 1750 when he turns 21. It is most likely he continued to run the farm, tavern and ferry as he seems well established in the community by the time he becomes an adult in 1750. It is also during this time period, if the family stories are correct, that his brother, Jonathan seems to have risen steadily as a maritime officer if even a fraction of the accounts are true (see the post about Jonathan Dawson form more details). From the family folklore he appears to have achieved the rank of a naval officer of some standing and I suspect he may have been a ships Purser. It is unlikely he could have been a Captain so young but that doesn’t diminish whatever success he was experiencing at the time. In 1748 when Jonathan was just 17 he married Frances Rouse who was living in Wilmington, North Carolina, and who I am guessing was about the same age (5). As a promising officer it was probably seen as a good match but the marriage was not to last. He died at sea while she was pregnant with their first child just a year later in about 1749. Frances, now a young widow with a new baby, then married Jonathan’s brother, William. It is likely they married in around 1750 at about the same time William turned 21 and inherited his father Geoffrey’s estate. They were certainly married no later than 1754 when they appear together as spouses in several different deeds. Although it seems likely that Joseph was the son of Jonathan Dawson I should mention that in 1770, Joseph Dawson is noted in a deed as calling William Dawson, “my father” and receives the bulk of William’s estate. Given the scarcity of records about Jonathan Dawson it’s hard to say either way. Regardless, he was raised by William Dawson. Besides being newly married William Dawson also began buying and selling property throughout the 1750’s. Some of his earliest land transactions are joint properties he owns with William Hodges in 1751 and again in 1754. William Hodges is another neighbor closely associated with William Dawson along with Thomas Armstrong and Jonathan Llewellyn. William was eventually involved with multiple land transactions will all three of them. Now an adult, William Dawson was enjoying the benefits of having both property and position. Throughout the 1750’s he continued to his expand his influence in the community and became one of Cumberland County’s more prominent citizens in his day. In part two I will go into more detail about his life during the 1750’s and conclude with his untimely death in 1761. Note (1): I used the term “oldest son” as this is how William is described in a [date] deet, as the “oldest son of Geoffrey Dawson.” Whether this means he was actually the oldest son or just the oldest surviving son is unknown. I suspect the later though. Note (2): The Armstrong children were probably Thomas Jr., William and Francis. Note (3): There is also some evidence that suggests Thomas Armstrong was in North Carolina much earlier in or near Bertie or Onslow Counties and not part of the Argyll Colony at all. Note (4): The record of this bond is just an abstract and it is fairly vague but this is my interpretation of its meaning. Note (5): The ages of Frances Rouse and Jonathan Dawson are estimated based on William’s estimated birth date and then having a sibling born two years later. When I first discovered this early ancestor she was the one person who fascinated me more than any of the others. I may be uncertain about whom exactly Jonathan Dawson had been but there is little doubt that Frances was the mother of the three Dawson boys and later several Williams children. 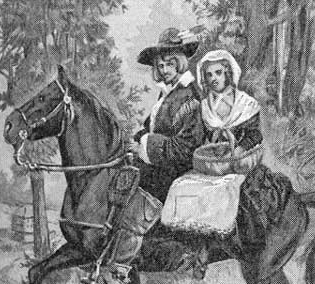 His [Jonathan Dawson’s] wife was Frances Rouse – she was living at Wilmington at the time of her marriage… In those times men would go to sea when crops were layed by who had large farms. Jonathan Dawson was a sea captain and was lost at sea but owing to the delicate condition of his wife her friends would not tell her of his death till after her baby (Jonathan Dawson II) was born [in] 1750…After his death his wife, Frances married General Williams and had several children. They moved to Edgefield District (It was then 96 dist). He [Jonathan Dawson] died on a boat and the fact of his death was kept a secret from his wife for six months as she was pregnant. She was a woman of delicate feelings, and it was feared that the shock would kill her… His wife was a Miss Frances Rouse. She was living in Wilmington at the time of their marriage… After the death of Jonathan, his widow married Gen. Williams of South Carolina and removed to that state. The early life of Frances Rouse is still largely clouded in speculation. She was born sometime between the mid 1720’s and the early 1730’s. My estimate of her age based on the life events of her children is that she was born in about 1727. According to the family traditions quoted above she was living in New Hannover County, near or in Wilmington, North Carolina in 1748. This would make her about 21 at the time of her marriage but she certainly could have been younger. There is still a great deal of uncertainty regarding who her parents were and where she was actually born. She may very well have been Welsh as the Dawsons, Willams and other allied families generally were. Her most likely origin is with either the Alexander or John Rouse families that settled in the Dulpin and Dobbs counties of North Carolina. It is confirmed that she was literate at least to the degree that she could sign her own name and probably well beyond that. The estate inventory of her husband William Dawson was recorded by the court clerk but presented by Frances by what was likely her own written list of his possessions. In both accounts of her she is said to be of a delicate nature to the degree that the death of her husband was kept from her while she was pregnant. This may have been the case but she seems to have become quite resilient as she grew older. She lived most of her life on the southern frontier, survived three husbands, raised at least three confirmed Dawson children and probably two more by her third husband Jefferson Williams. Her children went on to become patriots and at least two (Joseph and Jonathan) served as Captains in the American Revolution. She lived on the Cape Fear River for nearly 20 years before moving with her third husband, Jefferson Williams, to South Carolina in about 1768. Jefferson died before 1785 and according some unconfirmed sources she died in the Edgefield District in 1790 when she was approximately 63 years old. Many children in the Dawson and Williams lines named descendents after her for several generations. Among her children their fathers lived and died but she remained constant throughout their lives and into their adulthoods. As mentioned in my last post there were also one or more bonded individuals living in the Dawson household. This information comes from surviving court records transcribed in the book Free African Americans of North Carolina, Virginia, and South Carolina: from the colonial period to about 1820, Volume 1, by Paul Heinegg. In his book the transcript recounts the bonding of three children of a woman named Margaret Berry (b. about 1735) between 1757 and 1758. 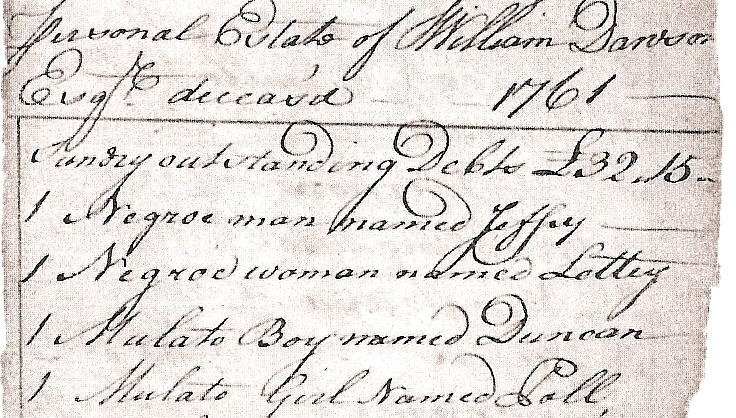 In January of 1757 Timothy Cleven had a claim rejected in the Cumberland County Court to have Margaret Berry’s three year old “mulatto” son Anthony bound to him. Instead, Anthony was bound to William Dawson, Esquire. The reason for this rejection was not stated but it could have been due to Timothy Cleven’s health as he is deceased by October of the same year. Margaret Berry was in the Cumberland County court again in the January session of 1758. This time it was in regard to her two year old “orphan” son John Berry (born about 1756). It is unclear if her husband had died prior to her 1757 court appearance or between that date and this appearance in 1758. In either case her ability to support them seems to have come into question. John Berry was supposed to be bound to Michael Blocker but this was rejected by the court and John was instead bound to William Dawson. This apparently arose from a complication with the bond of Anthony Berry who was born while Margaret was still a servant. It is not clear from the record if Anthony Berry was taken from the Dawson’s but if Anthony’s father had been a slave he would probably become that unnamed master’s property. Later that year in the July court Margaret was before the justices again with her infant son named Thomas (born in 1757). Thomas was bound to Michael Blocker without further commentary. I should also note here that 1758 was also the year William Dawson Jr. was born so the Dawson’s may have been too busy to take on another child. As a Justice, William Dawson seems to have moved the court grant his requests and I do wonder why he seemed to force the issue of taking custody of two of these children. After this there is no other mention of Margaret Berry and it is unknown what became of her afterwards. I also don’t know if all three of her children were illegitimate or not – or if perhaps only Anthony was. The name of her husband is not mentioned though there must have been one for John to have had an “orphan” status. In either case she was apparently unable to care for them after the death of her husband. I can only guess it seems that she was likely pregnant with the last child at the time of his death. I do find her plight eerily similar to that of Frances Dawson’s although their outcomes are quite the opposite. Both women had three sons and were pregnant when their husbands died. Without friends, family and assets it could have been Frances there before the justices to see her children taken from her and bound into service. Life on the North Carolina frontier was not an easy one. However, a difficult time was ahead for everyone living in the Cape Fear region. According to Harnett County historian Malcolm Fowler, a “black death swept the Cape Fear country and wiped out the river families by the dozen” before the end of 1761. If there were other Dawson children that didn’t live to adulthood this may have been the time when they were lost. In 1761 Frances had just become a mother again with the birth of her third son Jonathan. During 1761 there were also two notable deaths I need to mention. The first was Michael Blocker who died in January of 1761 and what happened to Thomas Berry after that is unknown. The second is the death of tavern keeper and Cumberland County Justice – William Dawson, Esquire. He was recorded as deceased by the summer of 1761. It seems likely that both men may have succumbed to the disease that swept though the region at that time. Based on an estimated age William Dawson was about 32 years old when he died. Frances survived though. By 1762 she appears to have remarried again and between 1765 and 1768 she and her new husband, Jefferson Williams, had packed up their household and moved to the Old Ninety-Six district of South Carolina. I mention this because there is an interesting note about a John Berry from that area. At the time of the American Revolution there was a John Berry who served as a Lieutenant and later as a Captain in the Lower Ninety-Six District regiment. He served in the militia from 1776 to 1782. Jefferson Williams, Joseph Dawson and Jonathan Dawson were all militia captains and it would be interesting if this John Berry turns out to be the one bound to William Dawson back in 1758. I haven’t found much on this John Berry so far but I look for him from time to time. The romantic in me hopes it’s him. William Dawson and Frances (Rouse) had more members in their household than just their family. As I suggested in my previous post I think there was quite possibly an older daughter named Mary in addition to their three sons: Joseph (b. about 1750), William (b. 1758) and then Jonathan (b. about 1761). In addition to any guests who frequented their tavern they also had one or more bonded children and at least four slaves. There are no ages listed and I can only assume they remained with the family after Frances remarried to Jefferson Williams. In all likelihood they may have traveled with the Dawson-Williams family to South Carolina in the late 1760’s. Unfortunately this is all I know about them and if anyone knows more please post a reply below. Jonathan Dawson is considered the earliest known ancestor in America for this line of Dawsons. There are several accounts of who he was and yet he is still a mysterious figure of uncertain origins. Below I will include the recorded evidence from three different accounts of him and then the results of my own research about Jonathan. The problem with Jonathan Dawson is that despite the detailed recollections of who he was there is no concrete evidence of his actual existence. There are no deeds, court records, or other documents that verify any of the information on him detailed below. However, this lack of documentation does not mean he did not exist. The counties where he probably lived in North Carolina have had a series of fires and many documents from this period were lost. Also, he was only in North Carolina for at best 7 years before his death so there were probably few records about him to begin with. Even in his death he was less than helpful as he died at sea and not in North Carolina at all. Jonathan Dawson was from England as was born in about 1719. He arrived in NC in 1743 and married Frances Rouse who was born about 1723 in Wilmington, NC. They settled on the Cape Fear River in NC and had three children: Joseph (b.1745), William (b. abt 1748), and Jonathan (b. 1750) all in Wilmington NC. Jonathan died on a boat and his death was kept secret from his pregnant wife, Frances, for 6 months. After Jonathan’s death she married a General Williams and moved with her family to the Old Edgefield District of SC. Frances Rouse died in the Old Edgefield District in 1790. Jonathan Dawson was an Englishman who came to America in 1743. He settled on the Cape Fear River at Wilmington, NC. He died “here” but the year is unknown. He died on a boat and this was kept from his pregnant wife, Frances, for six months. She was a woman of “delicate feelings” and it was “feared that the shock would kill her”. Jonathan was an active, intelligent, and enterprising man. He was “engaged in Merchandising, trading and shipping”. His wife was Frances Rouse and she was living in Wilmington at the time of their marriage. Jonathan and Frances had three sons: Joseph, William and Jonathan. After Jonathan’s death Frances remarried to General Williams from South Carolina and they removed to that state. Jonathan Dawson was originally from Virginia (or perhaps an immigrant). He came from Virginia to settle on the Cape Fear River near Wilmington NC in 1748. He married Frances Rouse, who was living in Wilmington when they married. Jonathan Dawson was a sea captain who was lost at sea prior to the birth of his son Jonathan in 1750. 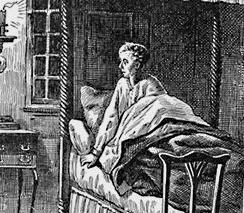 Frances, due to her delicate condition, was not told of his death until after her baby (Jonathan) was born in 1750. After Jonathan Dawson died Frances married General Williams and had several children by him. Of the three I think this letter from Pherbia Atwater Allen has the most useful and accurate information about Jonathan. For one thing, it notes that Jonathan settled on the Cape Fear in 1748 and was deceased by 1750. This is too brief of a period to leave more than a few records and those appear to have either not survived or remain undiscovered (at least by me). Another thing is that although he was supposed to be the father of three sons he was only married for about three years. Unless he and Frances had a child and then twins it is unlikely that he could have fathered all three in such a short space of time. I have suspected this for some time for reasons beyond just this account. I actually think Jonathan Dawson may not have been the father of the three boys. Notice that the only approximate birth date of any of the three children is for Jonathan who is described as being born in about 1750. In most repeated versions of the story the births of the children are squeezed into the timeframe of 1743 to 1750. This fits nicely except that these dates of births are much too early for the children. Let’s take what is known about the three Dawson boys in order. The first record of property purchased by the eldest son, Joseph Dawson, that I have found was in 1770. As he would need to be 21 to be considered an adult and buy property this makes his approximate birth date 1749 or 1750. He is also married Elizabeth Gibson in about 1770 and their first child was born about 1772. A birth date of 1743 is possible but seems too early. It think 1750 is much more likely. William Dawson, the second child, is generally considered to have been born around 1748. The most significant problem with this date comes from the pension application for his service in the South Carolina Militia during the American Revolution. Going through this substantial document makes it fairly clear that this is the correct William Dawson. The problem is that in the beginning he gives testimony that he was born in 1758. This is much too late for him to have been the child of Jonathan Dawson. His life events also fall in better with a birth date of 1758. The younger Jonathan Dawson’s birth date is also an anomaly. Although the only child with a listed birth date I have to say that 1750 seems way too early for him. The primary reason for this would be his marriage and family. His wife, Repsama Nicholson was born in 1770. Although not unreasonable that is a bit of an age gap. Secondly, although there is no evidence of a first marriage Jonathan and Repsama start having children in 1798 when he is 48 years old. Their last child on record was born in 1814 when he would have been 64! Although this is possible it does seem a bit improbable. I think it is more likely that Jonathan was born closer to 1760 or 1761. So, with this in mind you might wonder how Jonathan Dawson and Frances Rouse had these children at all. I am suggesting here that I think all three were probably born after the time of Jonathan Dawson’s death at sea. Now, if this was the case wouldn’t they all go by the name of Frances’s second husband, General Williams? Wouldn’t we all be researching the Williams family instead? Well, although I have never found records of Jonathan Dawson the sea captain and his wife Frances I have found records for a Frances with the married name of Dawson on the Cape Fear River. She was married to a man named William Dawson who was a Justice in Cumberland County, NC. This William Dawson was the son of a Welshman named Geoffrey Dawson who settled on the Cape Fear in 1737. William Dawson was also the owner of the Dawson’s Ferry and the proprietor of a Tavern there. This is all documented. What is more, Joseph and William Dawson both inherited land from him and in one land transactions Joseph Dawson even refers to the elder William Dawson as “my father”. William Dawson died in the summer of 1761 and his wife Frances presented the inventory of his estate in the Cumberland County Court. In regard to General Williams, who would really be the third husband of Frances, his name appears to have been Jefferson Williams. He lived in Cumberland County by at least 1760 and was associated with the Dawson family. By 1768 he and his wife Frances own property and are apparently living in the Old Edgefield District of South Carolina. During the American Revolution Jefferson was not a general but a Captain of light cavalry. As an interesting note, in William Dawson’s pension application he mentions that the first officer he served under was Captain Jefferson Williams. Well, I personally think the account written by Pherbia Atwater Allen is the most accurate source of the three. All are collections of family stories but Pherbia’s seems like it was much closer to the first hand recollections of these facts. I think both have very valid information in them though and each adds a bit to the story. When combining these accounts there are surprisingly few actual conflicts between them. I think Jonathan arrived in Virginia from elsewhere (perhaps England) in 1743. He then relocated to the Cape Fear River near Wilmington in 1748 and married Frances Rouse. I think Jonathan died at sea while she was pregnant with their first child. Based on other information I have found I suspect that this may have actually been a daughter named Mary. After Jonathan’s death I think Frances remarried to a man who was in all likelihood his brother, William Dawson. I think that it was William and Frances that had the three sons: Joseph, William, and Jonathan – all born between about 1750 and 1761. There may have been other children as well that didn’t survive to adulthood or that were daughters misplaced through marriage. However, with two husband’s named Dawson only Jonathan’s dramatic end preserved his first name in the oral traditions of the family. The good news is that I think that researches looking into the line of Dawsons from the three sons (Joseph, William and Jonathan) can be less concerned with the origin and life of Jonathan Dawson as William Dawson seems to have been their actual father. This doesn’t make things much easier as William’s father Geoffrey’s origin is almost as cloudy as Jonathan’s but at least he is on record from his land patent on the Cape Fear River in 1737. In future posts I will dive into these individuals in much more detail. What I have written above is only a portion of the material I have on them but I think it serves as a good basis to work from. Much of it is based on my own speculation so if your conclusions differ by all means please share them in the comments below.